Two Ladue Broadcast Technology students, Grace Hensley, and Marilyn Lercel, produced video interviews for Educate.Today's "Celebrating Military Families and Military Service"program. 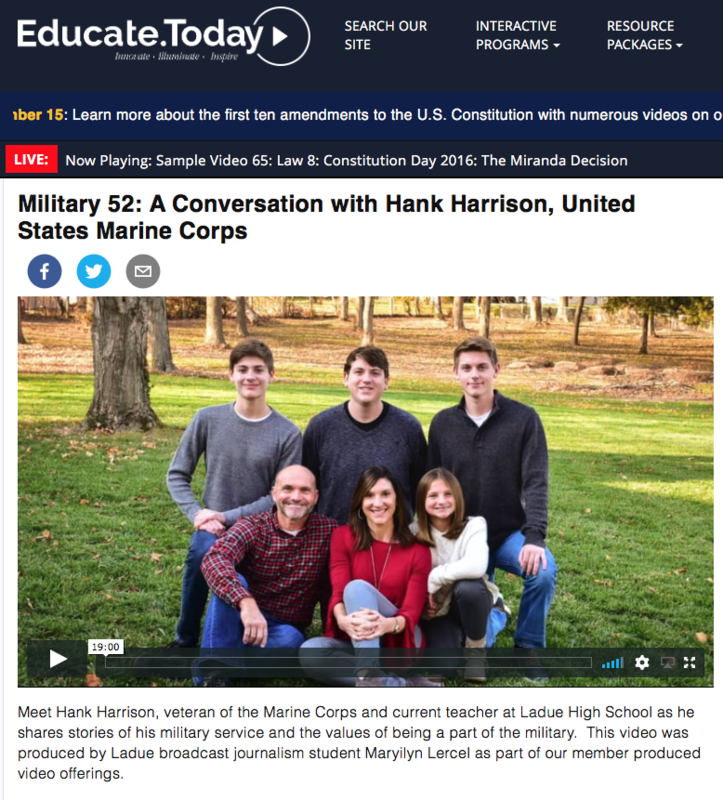 Marilyn interviewed Ladue High School Practical Arts teacher, and Marine veteran, Hank Harrison, in our new broadcast television student at the high school, about his experiences in the Marine Corps as a young man out of high school. Each year on the fourth Saturday of October, Americans celebrate National Make a Difference Day, a national day of community service. 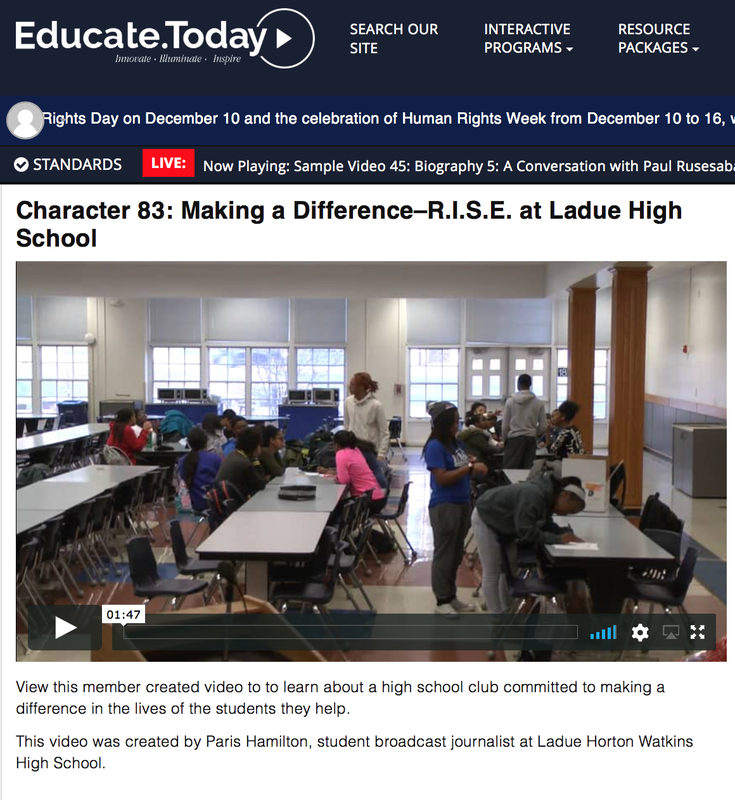 This year, as part of it’s commitment to making a difference, Educate.Today (HEC Media) invited Ladue Schools students to share how they are making a difference in their community. Grace Hensley and Jenna Gold also provided Sparkle Effect video stories for this segment of the program. 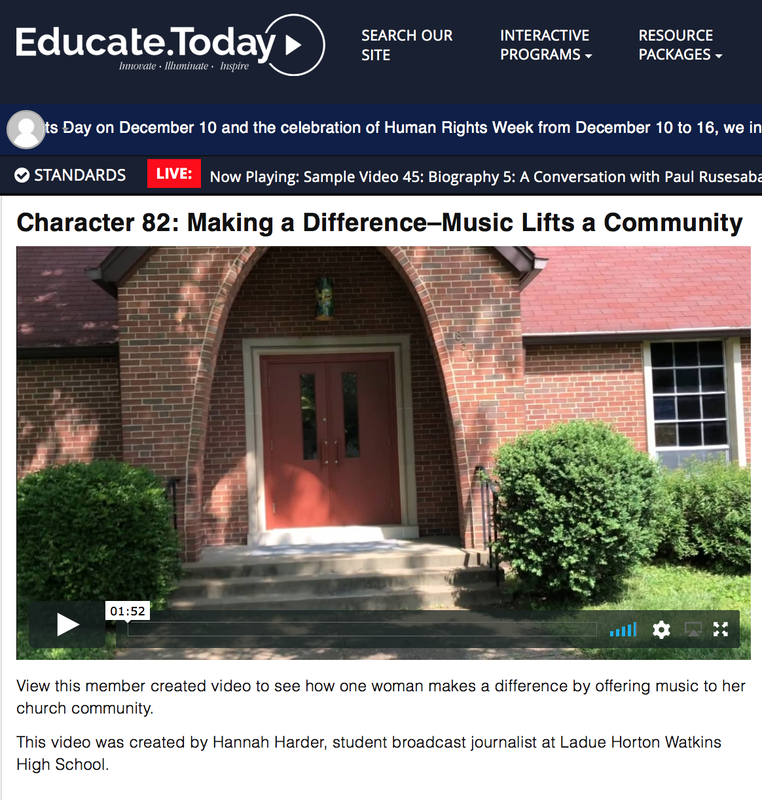 “Making a Difference—Building School Community Through Inclusion: The Ladue High School Sparkle Effect Story” first aired on Educate.Today’s Thursday, Oct. 18 program for a day-long series of interactive programs celebrating the value, power, and outright joy of Making a Difference. You can watch the archived show by clicking here or on the image above. 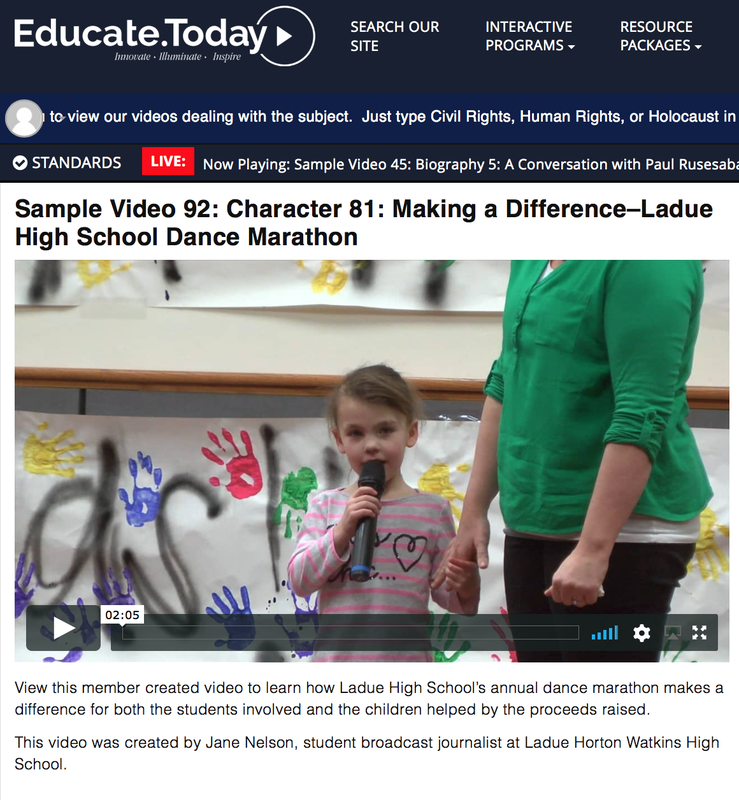 To watch other "Making a Difference" featured stories produced by Ladue Broadcast Technology students, click the images below. Ladue student Marilyn Lercel took part in the programs as an Interactivity Reporter and news reporter, Paris Hamilton acted as a Camera Operator and Assistant Stage Manager, and alumnus Jane Nelson provided a First Amendment Commentary. This free, interactive program occurred September 20, 2108 and is now complete. 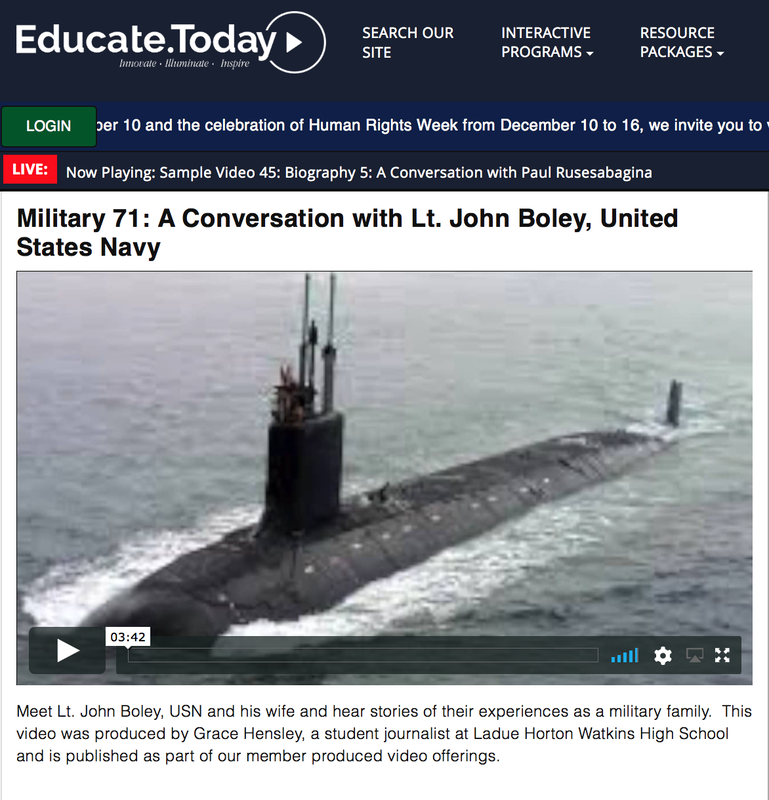 Over 70 archived videos from the day long interaction on the First Amendment are now available on the Educate.Today website. Video topics deal with all aspects of the First Amendment and include expert analysis from constitutional scholars, political science professors, judges, lawyers, and first amendment advocates. Just type “First Amendment” into the keyword search box on the home page of Educate.Today for a complete list of free videos now available for you and your students. Guest for this program was Jessie Steffan--Staff Attorney, ACLU of Missouri. Guests for this program were Hon. Nannette Baker, Chief Magistrate Judge of the Eastern District of Missouri and Mary Beth Tinker, Tinker v. Des Moines. Guest for this program was Gilbert Bailon, editor of the St. Louis Post-Dispatch. Video produced by Jane Nelson, student journalist at Ladue Horton-Watkins High School, to hear her views on the importance of student journalism. Ladue Sophomore Grace Hensley would you like to imagine a life where citizens are not afforded the 5 freedoms of the First Amendment. Ladue Senior Max Goldberg defines what it means to have free speech in the US Constitution's First Amendment.